So this here is one of those projects that I had started ages ago but never blogged about. I had started knitting this project, finished the key design point of the entire pattern, lost interest, totally forgot about the whole thing, picked it back up again when it was casually mentioned to me a few months ago, only to knit a few rows before promptly setting it down for a more exciting project. Then a few weeks ago when I went through my WIPs (and realizing that I have several) I made the executive decision to finally sit down and tackle this project and get it off the needles (not to mention it was holding 3 cables from my Knit Picks Interchangeable Needles set hostage!). So let me finally and officially introduce to you my project: this here is the cult cardigan that I was seriously obsessed with ever since the pattern appeared in the Fall 2011 Interweave Knits magazine -- The Dahlia cardigan. I had cast on this cardigan during a Bitchy Bees' beer knit night back in October, which was the official start day to the Dahlia KAL that I was doing with a few other Bees. 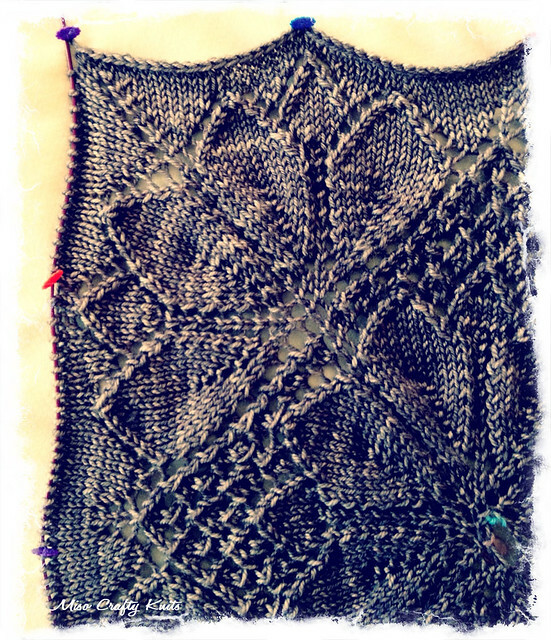 I had decided to not knit a gauge swatch (gasp!) but instead, upon the brilliant suggestion by my friend Jennifer, I had knit a small section of the pattern with the recommended needle size. The section was small enough to knit up (it was actually swatch size!) and would have taken the same amount of time to knit up as a gauge swatch. As Jennifer had pointed out, by knitting this section, if I made gauge then I would be one section ahead of the game whereas if I had knit a traditional swatch I would have then had to start knitting the actual pattern. I was actually saving time. If I was off, then no biggie. I would have had to re-knit the swatch anyways to find my correct needle size. Pure brilliance. I heart you Jennifer! So you bet I was full of glee when I made gauge with that section. Just to make sure, I had knit up the next section that was slightly bigger than the first. I had made both stitch and row gauge. Boo-yeah! Then I got to the most exciting part of the entire project - the back lace panel. Oh man, let it be known that I couldn't.stop.knitting.it. I'll admit that I always feel so freakin' clever when I knit lace or when I have to knit from a chart. Not sure why. But I do. I had knit that lace panel in record time too. I was seriously giddy the entire time I was knitting it and it was soooo incredibly satisfying when I done. It took every fibre of my being to not block that bad boy out (I had read on the designer's thread for the pattern to not block it beforehand). Instead I kept stretching out the panel and admired my work. I kept nudging Brett and showing him, forcing him to oohh and ahhh over it like I did. When he didn't bow down to me and my lace knitting genius I stopped showing him the panel and told him he didn't appreciate true art. I don't think he cared either way. Oh well, his loss. So...back to the lace panel. The lace panel was done. And so was I. The rest of the pattern is nothing but endless amounts of stockinette. Very anti-climatic if you ask me. I think my fellow KAL friends could probably agree with me on this one. So I took a hiatus on this project to knit up quicker projects...and bulky sweaters. Eventually the project just got forgotten. Ahh...the life of a fickle knitter. I totally forgot how wonderful the yarn I'm using felt and how much I love the colour. This is my first time knitting with Madelinetosh Pashmina and I will definitely put it out there that this will not be the last time either. The colour: my beloved Composition Book Grey. I was seriously chasing after this certain grey in any of the MadTosh bases all last summer. It's such a popular colour that a lot of brick and mortar stores in my area, as well as online shops couldn't keep it in stock, and if they did they would only have a random skein left. My previous Madtosh experiences had taught me to purchase sweater quantities of a specific colourway all at once, in hopes that all the skeins would be coming from the same dye lot or would somewhat match. I currently have 3 skeins of a (gorgeous) colourway in a different base that I just realized the other day, are all completely different. I had bought 1 skein locally and picked up the other 2 while on the mainland (when I decided that I had no use for just 1 skein), and when I had really looked at them (as in I was in broad daylight) I discovered that 1 skein was more green with no blue, 1 was way more blue and no green, and the third was a beautiful mix of green and blue. It's definitely the nature of hand dyed yarn to vary a bit from skein to skein, but now I think I need to reconsider my plans for that yarn. Anyhoo, I'm making it my mission to finish this cardigan before gift knitting season is in full tilt. I was planning on wearing this to Knit City in October but decided to nix that plan and stick with my original idea - to wear something that was knit using locally dyed yarn and in a pattern by a local designer. And before I get a bunch of messages on Ravelry/Facebook and emails - yes...I am fully aware that Knit City is only a month and a few weeks away. It's a lot of pressure but I think I can knit a cardigan in a month. It's do-able. Right? Hahaha...if it weren't for the other ladies in my knitting group wanting to do a KAL, I don't know if I would have started it yet. I'm hoping my FO won't disappoint you! Thanks! :) There's a whole series of them, and each and every one of them is cuter than the last! I wish I had more cupboard space to collect them all! What a cool pattern. That first photo is so pretty and inspirational. Thanks Hannah! The lace part is what really grabbed my attention to this pattern! Are you going for the day or weekend as well? We should totally meet up for it! Yeah, our little KAL for the Dahlia was a joke! Jennifer whizzed past us and the rest of us lamented over how boring it was after the thrill of the lace panel! Okay lady, you better not finish your sleeves before me - and I'm the slowest Dahlia knitter ever! You're putting the pressure on me! I don't think it was a joke Nat! Cause really, if it weren't for the KAL I don't think I would have started this project...which is silly considering that I love the design so much you'd think I would have started it pronto. Besides, it was fun in the beginning and then life just happened. Not to mention that Jennifer is a category all on her own! ;) She's such a knitting machine! 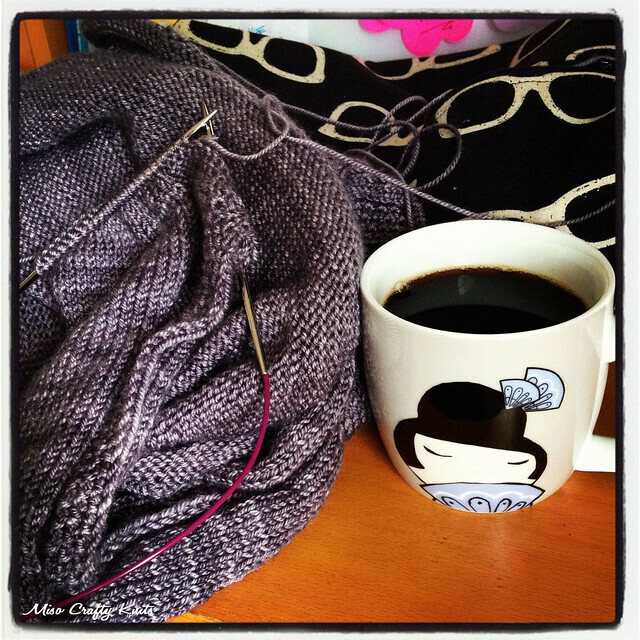 So glad I reads this post or I would have had no idea that Knit City was even happening! Where have I been?? ahh i've had this in my queue ever since it came out. i keep changing my mind what to use however, so it's never been cast on. that and i'm a little concerned about the narrowness of the sleeves. yours looks lovely so far! I had a hard time picking out what yarn I wanted to use too. I knew what colour I wanted, but it surprised me that I had so much trouble finding the right shade of grey! I'm hoping I don't have issue with the sleeves...I normally do anyways since I have meaty upper arms, but fingers crossed that they'll be ok! This pattern has been in my queue forever and I'm finally knitting it. I know that feeling of "I am SO smart" when knitting lace, I love it! The Lace panel is quite beautiful. I'm so glad there are other's that feel the way I do when it comes to lace. Sometimes I wonder if I'm an oddball for thinking that way! ;) You'll have to let me know when you're done yours so that I can see it! !